It's been a fantastic 2012. I don't even want it to end! But alas, New Year's eve is here and now we celebrate the end of this year into the new. Tonight, thirty of us will be gathering at a friend's house for a black tie pot luck (we should be dressed our best to ring in the new year!). I don't have much time to prepare today and everyone else seems to be bringing heavier dishes like roasts and potatoes. So I'm turning to one of my favorite quick antipasto recipes. Andrew Carmellini's A Voce ricotta cheese dip. It sounds simple, and it is, but the dish blew me away the first time I had it at A Voce NYC all those years ago. One of the keys to the spectacular nature of this dip is, as always, the ingredient(s) involved. Carmellini uses a particular Sardinian sheep's milk ricotta, whereas most ricotta you'll find at specialty stores are made of cow's milk. The second key is to whip in a splash of milk for extra fluffiness against the denseness of the cheese. This results in a richer, tangier, velvetier ricotta dip that will usually have guests scraping the bottom of the bowl for. 1. Beat the ricotta and the milk together in the bowl of a standing mixer fitted with the paddle (or in a medium bowl with a whisk) until the mixture is light and fluffy. Add the fine sea salt and mix well. 2. Place the mixture in a serving bowl. Generously sprinkle the sea salt, pepper, thyme and oregano over the top. 3. Top with the olive oil, which will settle on and around the cheese. 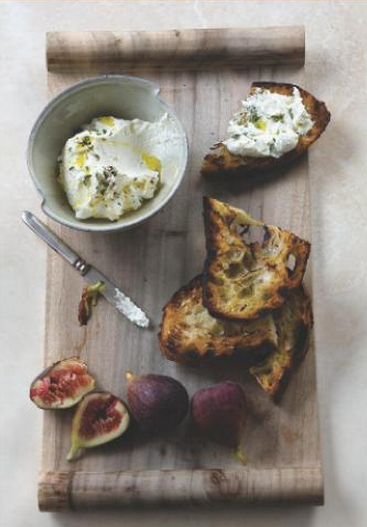 Add sliced fresh figs or shaved truffles. Serve with grilled bread.